Torse was the first of Duchamp-Villon’s sculptures to be recognized by his contemporaries as authentically modern because of its reductive form and geometric approach. Its subject reveals his enduring interest in archaic Greek sculpture, while the figure’s massive planes reflect the sculptural density and geometricizing of forms that he adapted from Cubist work. Duchamp-Villon sent five works to the Armory Show in 1913: Façade architecturale (plaster, 1912, destroyed), Torse (bronze, 1910, Hirshhorn Museum and Sculpture Garden, Washington, D.C.), Fille des bois (bronze, 1910, location unknown), Danseurs (terracotta, 1911, Munson-Williams Proctor Arts Institute, Utica, New York), and Baudelaire (terracotta, 1911, location unknown). For the most part, the Armory Show’s critics were indifferent or unsympathetic to Duchamp-Villon’s work. Façade architecturale—an architectural façade that the artist designed, constructed, and sculpted—was the subject of a pamphlet written by Walter Pach titled A Sculpture’s Architecture that was for sale at the exhibition, and so received more attention in the press than his other works. Unfortunately for the artist, the Façade was roundly condemned by the New York Evening Post, the New York Globe and Commercial Advertiser, and The Independent, among others. Despite the negative attention from the critics, the more forward-thinking artists and collectors who saw Duchamp-Villon’s work were enthusiastic. The collector John Quinn purchased both Torse and Fille des bois, and one of the exhibition’s co-organizers, Arthur B. Davies, purchased Danseurs. See George Heard Hamilton, “Raymond Duchamp-Villon,” in Raymond Duchamp-Villon, introd. by George Heard Hamilton (New York: Walker, 1967), 14. Walter Pach, A Sculptor’s Architecture (New York: Association of American Painters and Sculptors, 1913). See “International Art,” New York Evening Post, February 20, 1913, 9; Arthur Hoeber, “Art and Artists,” New York Globe and Commercial Advertiser, February 17, 1913, 8; and Frank Jewett Mather, Jr., “Newest Tendencies in Art,” The Independent 74: 3353 (March 6, 1913), 506. 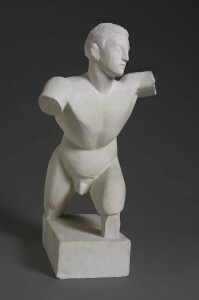 The French modernist sculptor Raymond Duchamp-Villon was the brother of the artists Jacques Villon and Marcel Duchamp, who also exhibited works at the Armory Show. He began his career as a sculptor in 1899 when a case of rheumatic fever forced him to give up his medical studies at the Faculté de Médicine in Paris. Immobilized for a considerable period of time, he occupied himself by modeling small statuettes of animals and female figures, and thus discovered his true vocation as an artist. Though he was essentially self-taught, he quickly attained skill and recognition. In 1902 he exhibited a portrait of his future wife in the Salon of the Société Nationale des Beaux-Arts in Paris, and beginning in 1905 he regularly exhibited in the annual Salon d’Automne. In 1906 Duchamp-Villon moved from Paris to the suburb of Puteaux, where he shared a house and garden with Jacques Villon and the Czech painter František Kupka. His interactions with other artists in Puteaux prompted him to abandon his early traditional style and begin to explore Cubism. Duchamp-Villon took a central role in the Puteaux Group, also known as the Section d’Or, which was united in the belief that Cubism was a universal continuation of the tradition of the golden ratio—the mathematical proportion that is believed to maximize the aesthetic appeal of a composition—that had fascinated artists and intellectuals for thousands of years. In 1912 he took part in the Salon de la Section d’Or (Golden Section), a major exhibition of more than two hundred works that was held at the Galerie de Boétie in Paris in October 1912 and exposed Cubism to a wide audience for the first time. At the Armory Show the Duchamp-Villon brothers were the most successful artists of the exhibition after Odilon Redon in terms of sales. This was perhaps owing to the publicity they achieved through repeated publication of their photographs in the press—the only images of contemporary European artists that appeared in American newspapers. Though Duchamp-Villon joined the French army during World War I, he continued to work on his Cubist sculpture. In 1916 he contracted a case of typhoid fever that led to his death in 1918. For a basic biography and assessment of his work, see Duchamp-Villon: collections du Centre Georges Pompidou, Musée national d’art moderne et du Musée des beaux-arts de Rouen, exh. cat. (Paris: Centre Georges Pompidou, Réunion des Musées nationaux, 1998).